How to create automatic street lights using Arduino ? Automatic street light is one of the most well known projects in smart city. The objective is to create a setup where whenever a car passes the street light, the intensity of the street light will change depending upon the cars position. We can make it in such a way where only the lights located near the car will go and the rest will be completely off to save energy, but it might be dangerous if the driver can't sense whats coming from a long distance. For this project the basic requirements are led, IR sensor, arduino uno and some jumper wires. The basic principle in this project is whenever a car comes in the field of vision of IR sensor, the transmitter will sense that some obstacle is present at front and it'll inform the receiver about it. Using this basic idea, we can implement it in a program to detect the obstacle and raise the intensity of the light until it is in range, after that decrease it to the extent we like. 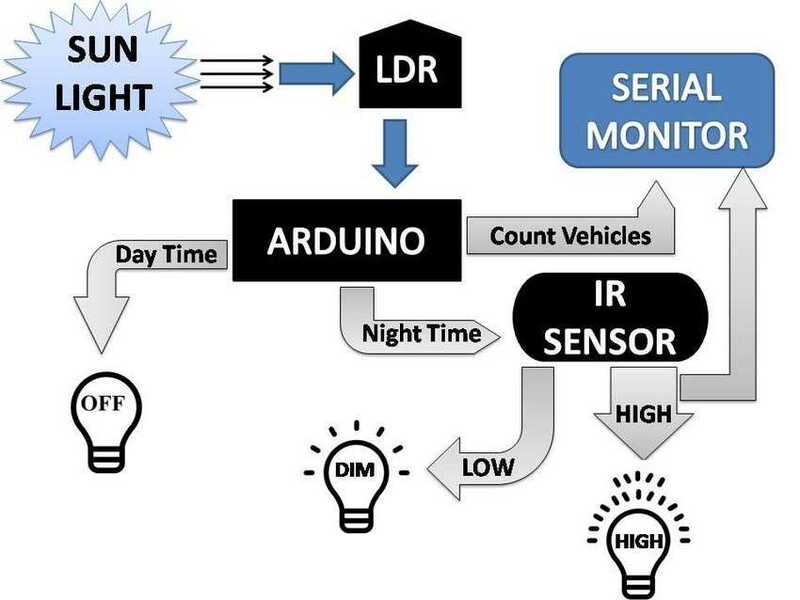 Not to mention we can also use an LDR to keep the street lights shut during day time to save electricity, and once the LDR senses decrease in sunlight, it'll automatically inform the Arduino board.